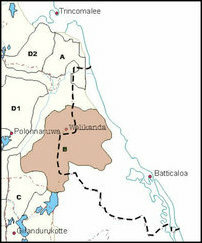 Tamil dairy farmers from interior Batticaloa, particularly those from Mayilaththa-madu and Maathava’nai in Kora’laip-pattu South (Kiraan) division, have been repeatedly complaining about large-scale Sinhala colonization taking place in the pasturelands of the country of Eezham Tamils since their area was seized by occupying Colombo from the protection of LTTE in 2007. After years of continuous agitation, the intrusion was halted to some extent a year ago. But, SL President Sirisena’s settler colonist goons continue to sustain their properties and huts in the pasturelands, Tamil farmers complain. According to court orders the illegal settlements including the huts should have been removed and activities such as agriculture in pasturelands should not take place. But, nothing has been removed so far, the Tamil farmers say. Although the colonists have adopted a low profile, the danger of Sinhala colonization still remains as Buddhist viharas and huts are yet to be removed, the Tamil farmers say. The SL Ministry of so-called Mahaweli development, has been responsible for ethno-centric structural genocide against Eezham Tamils from Batticaloa in East to Mulaiththeevu in North along the hinterland of eastern coast. The SL ministry is being largely led by Maithiripala Sirisena for several years since 1997. Even now, the SL President Sirisena continues to retain the portfolio of ‘Mahaweli development’. The large-scale appropriation has been spearheaded by Sinhala colonists from Polonnaruwa, the home district of Mr Sirisena. The plan of SL Mahaweli ministry is to let Sinhala colonists wait for some time while keeping their properties intact in the occupied territory and accelerate the occupation again, the Tamil farmers say. A move to claim compensation for the losses that have occurred to Tamil farmers should be taken forward if Tamils have to put an end to the settler colonialism, commented Tamil activists in Kiraan. Extremist Buddhist monks are also visiting the area along with Sinhala colonists, the farmers say.